Day 1: Baby Z has been such a little pleasure to be around today! It’s literally God’s miracle that he is entertaining himself for once! Whoop whoop! Day 2: The first Friday prayers of the Holy Month! Feeling blessed to have everything I have! Day 3: A visit to the graveyard today (to pay respects to my father-in-law, on his 7th death anniversary) and as always, a humbling experience. We need to all make the most of the life we have, it could be gone tomorrow. “And to HIM we all return”. Day 4: Feeding Baby Z his lunch and can’t help drooling over all the baby food! Mmm that smell!! How many more hours till i can break my fast please? Day 5: The thirst isn’t as bad as it was the first couple of days. Starting to get into the rhythm of fasting now. Day 6: My brother arrived for his 2 month summer holidays today and I am so happy… But there’s one hour till Iftar, and I think I got over excited and spoke too much so now my head is pounding! Really feeling the fast today! Day 7: Going grocery shopping whilst fasting is the hardest task ever!! I wanted to pick everything to eat after Iftar, mostly items that consisted of chocolate and ice cream! Day 9: What’s better than a good old shawarma? TWO shawarmas! This is turning into a little food diary isn’t it? Also, note to self: Do not attempt to wake up a baby when in deep sleep. It is like poking a bear. Let the bear sleep in his shirt and not his night dress! Day 10: Buffets always become disorganised because everyone rushes just before the Maghrib Azan! Also, we are already a third of the way through Ramadan?! HOW?! Day 11: Today I revealed my real self to the online community! I am overwhelmed with all the support from my social networks and blog! Perhaps I should have done this sooner? Day 12: Okay so remind me to never again bake chocolate cake whilst fasting! The struggle was far too real! God knows how I managed not to lick my fingers! Day 13: Mr Z had arranged a lovely surprise Iftar Date night at Dubai Mall! I had such a lovely evening, and it really made me count my blessings! Alhumdulillah! Day 14: Me and my brother are not feeling too well today. I decided to break my fast a couple of hours before Iftar because my headache was getting unbearable and my body felt so weak. Day 15: Not fasting today either. I feel like death and my body aches all over. My illness made me ponder over how lucky I was to simply break my fast so easily with a sip of water and an abundance of food in the house. Many people in the world aren’t that lucky, and they are very much in my prayers. Day 16: Halfway through Ramadan already! I am starting to feel better, but I still have the odd stomach cramp. I really have so much to be thankful for, Alhumdulillah. Also, after Iftar we went to the Ramadan Night Market in Dubai, which was flourishing and so busy! Day 18: Today we went to Pizza Hut for Iftari and boy was it delicious! I had their Ramadan special mojito: Rasberry and Rose Chill. Yummy but gave me a brain freeze. Day 19: Time to work out the Zakat that needs to be paid! Seems like quite a chunk, but Alhumdulillah giving it away will purify our wealth. A reminder to not be too greedy and money orientated. Day 20: News of the passing away of Bashir, the president of FOSIS, is all over my facebook feed. (May Allah grant him Jannat, and grant patience to his family.) I did not know him, but the overwhelming love is proof that he was loved by Allah. A time to reflect upon death and what we have achieved so far in life. If tonight was your last night on Earth, would you be satisfied? Would you be ready to return to God, happy in the knowledge that you have done good in this world? Take a moment to ponder over this. Day 21: The countdown to the last ten days of Ramadan begins. Laylutul Qadr lies in one of the odd nights ahead. Time to collect all the brownie points you can get! In sha Allah we are all rewarded for our worship. Day 22: I ate an entire baby chicken at Al Tajaz for Iftar today. I am as shocked as you are. Day 23: It’s possibly the last Friday of Ramadan. How did we get here so quick? Also there’s a huge possibility that it could be Laylutul Qadr today since being an odd night and also a blessed Friday. Lots of praying to be done to take full advantage! Also, the men got back from Tarweeh namaz with huge pieces of Chocolate cake. Apparently someone left it in the mosque fridge! May Allah bless you GREATLY, Mr Kind Stranger, for the joy you have brought me! On a side note though, why does the mosque have a fridge?! Day 24: We have held an Iftari Dawat (Get-together) at our home for close family and friends. A lot of meals must be prepared. I just hope Baby Z behaves himself. Day 25: A quiet day filled with plenty of pondering. Thankful to be at home with my family. Day 26: Iftar at a friends house today. Food was yummy and BabyZ was so excited to play with new toys! Win win for all! Day 27: Is Ramadan really almost over?! How is this happening?! Time to buckle down and pray with all the energy I’ve got. Day 28: Time to start putting on henna on my sister, mother-in-law and myself. Tempted to put a little on Baby Z too, when Mr Z isn’t looking! Hehe! Day 29: Eid has been declared for tomorrow! Yipee. Lots of cleaning and preperation to be done first though! Sad to know that yet another Ramadan has come to an end, and all we can pray is to be blessed enough to observe another month of Ramadan next year In sha Allah. So happy and feeling so blessed. This Ramadan has come and gone far too quickly. My first Ramadan fasting as a mother. What a challenge it can be when Baby Z decides to get whingy just before Iftar! Hats off to all the Muslimah mothers out there! Give yourself a massive pat on the back! Day 30: EID MUBARAK! 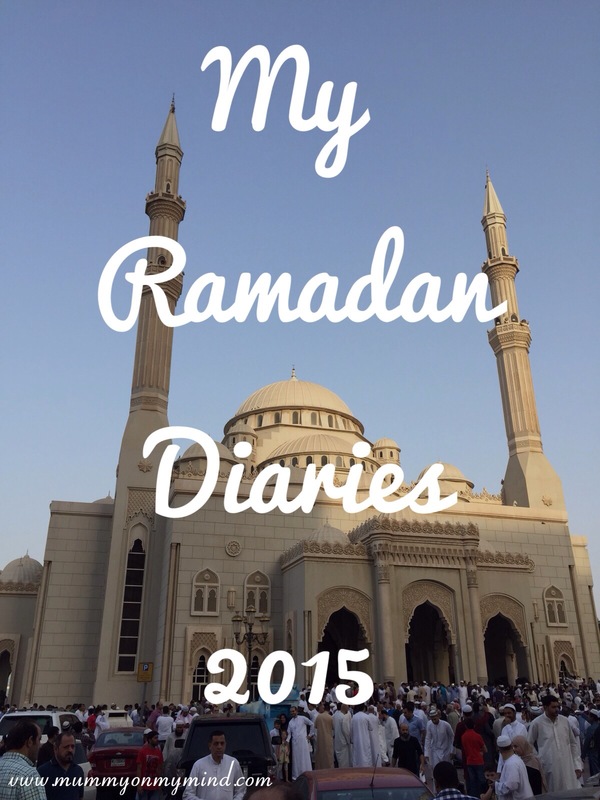 My Ramadan Diary for 2015 comes to an end here. I hope you all have a lovely Eid, wherever you are and whoever you are celebrating it with. Alhumdulillah for all our blessings. Thanks for reading! I am glad it was insightful for you. ? Thank you, I am glad you found the post so interesting! Haha I also pinch myself sometimes that am I really living in Dubai… Although I do really miss my family and friends back in England too.